Hao Ping was born in Yunnan, China in 1952. 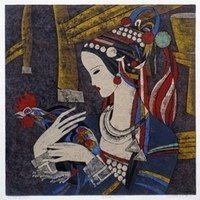 In 1980 he graduated from the Department of Fine Art of Yunnan Art College. In 1986, he completed advanced studies in printmaking at Central Academy of Fine Arts in Beijing. Hao Ping is a member of various art organizations and committees including the Chinese Fine Artists Association and the Chinese Print Artists Association. Hao Ping is a pioneer of modern Chinese printmaking, a movement that set in around 1980 when a new era of nearly complete artistic freedom began for Chinese artists. He is one of the most outstanding representatives of Yunan Prints of China. Art galleries all over the world all strive for his works. Hao Ping's art is two-dimensional like old Japanese Ukiyo-e. 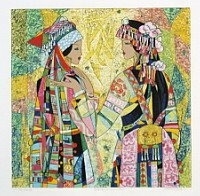 The delicate forms of the Yunnan ladies in their ethnic clothes of jewel tone colors are his signature style. He often uses up to 15 color blocks to produce the spectacular scenes and applys the modern medium of oil or acrylic pigments to his traditional woodblock art. Hao Ping received the Gold Award of the 13th National Chinese Print Exhibition. Arts come from artists’ experiences and all artistic forms are expressions of artists’ thoughts and feelings. To accomplish these expressions, external substances are used as media where painting is one medium commonly found. As a relatively indirect art form, woodblock is a unique painting whose material, production process, print marks and textures are different from other paintings. Therefore, how to strengthen the “woodblock image” through language purification and skill enhancement is an eternal goal for all woodblock artists. The so-called language purification, however, doesn’t mean isolation from other artistic languages. Instead, it means to empower the woodblock artists’ expression and widen their vocabulary by learning from other artistic forms broadly. I believe in using different forms to express different feelings. Therefore, my woodblocks have many different forms. Multiple color woodblock is an important form for me in which the rich colors of oil paintings and the drawing lines of the Chinese paintings are integrated together. By multiple overprints on one piece of plate, woodblocks with very unusual aesthetic interests are created. Certainly, they are just part of my creations and represent only the style of certain periods. In my mind, the form and the essence of arts should synchronize with each other to reach a harmony but not to compete who should take the lead. Only when they are integrated seamlessly then the art will be touching and contagious. A woodblock artist should be sensitive to the unique woodblock language like print marks and textures. It is essential for the success of a woodblock artist because it represents not only a rational technical achievement but also an expressional accomplishment of the artist’s heart and soul.